Happy St. Patrick’s Day! I’ll be joining the festivities later this evening, but first, a blog post. I promised to make last week all about furniture. I failed to keep this promise and only wrote one post. Shame on me! Let’s try this again. Hopefully I’ll find the time to write up everything on my list! 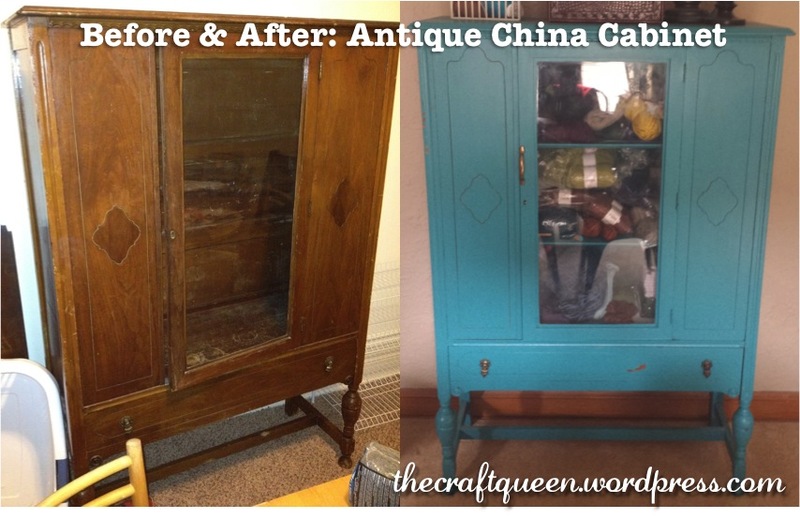 Today’s before and after is a lovely antique china cabinet I found on Craigslist. The young lady who sold it to me only wanted $35! It’s hard to tell from the photo, but the wood was not exactly in great shape. 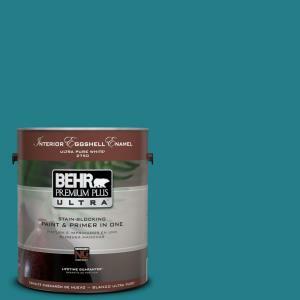 I decided to paint the cabinet, and decided on a deep turquoise from Behr called “Caribe”. Jason ended up being the one who painted this cabinet; I had a lot of projects going on at that time, and we just wanted to get them DONE. I think he did an excellent job. 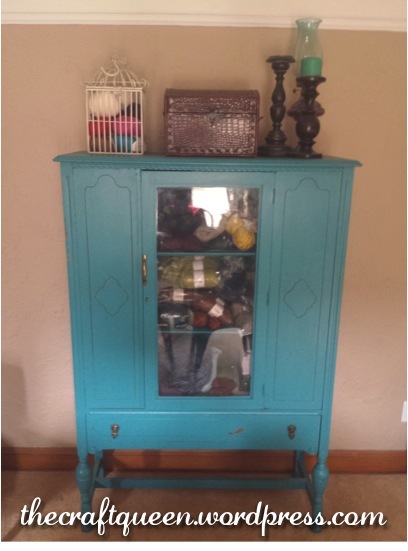 This cabinet got painted almost two years ago. I use it for storing all my yarn and knitting accessories, and the fact that it didn’t have a handle was super annoying. Last month, I went back to Home Depot and bought an antique-style cabinet pull, drilled a few holes in the door, and installed the handle. Much, much better. You’ll notice that the paint job has gotten quite a few dings. We moved since acquiring the cabinet, and it’s moved around a bit in our new place. Battle scars, my friends. Battle scars. I think they add a bit of character, so I probably won’t fix them. I also don’t have any more of this paint, so I’m sure that also has something to do with my lack of caring. 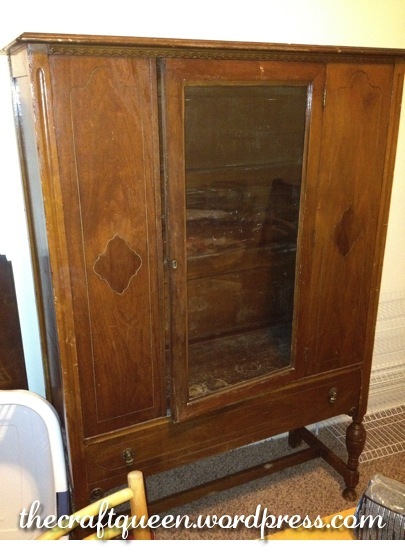 I seriously cannot believe it took me so long to show you this cabinet! The worst case of procrastination if I ever saw one. Make sure to check back tomorrow, because I’ll be showing you another furniture makeover: a set of vintage dressers! Do you like fashion? Check out my newest blog, Gabby Gets Dressed! 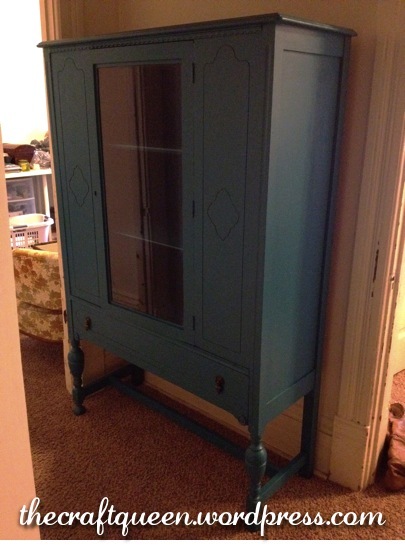 This entry was posted in Furniture & Home Decor and tagged antique, antique china cabinet, antique furniture, before and after, behr caribe, behr paint, craigslist, diy project, furniture, furniture makeover, how to, instructions, knitting storage, painted furniture, recycled furniture, repurposed furniture, storage cabinet, storage solutions, teal, turquoise, tutorial, upcycled furniture, vintage, ways to store knitting, ways to store yarn, yarn storage. Bookmark the permalink. Twas a good day for a Guinness to be sure!